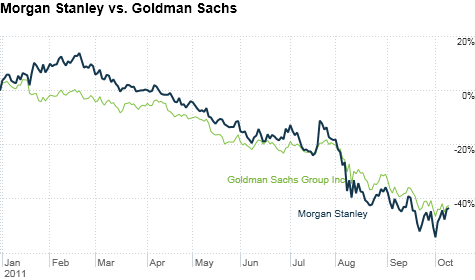 Morgan Stanley's and Goldman Sachs' stock price sink in 2011. Click chart for more market data. NEW YORK (CNNMoney) -- August and September's see-sawing stock market may have induced nausea among investors, but for Wall Street's major investment banks, this volatility has most likely taken a huge toll on profits. As banks' third quarter earnings season kicks off Thursday with JPMorgan Chase (JPM, Fortune 500), investors are bracing to see how much damage was wrought by the expected steep drop in investment banking and trading revenue. Those businesses have slowed considerably as the market volatility has caused merger and acquisition activity, initial public offerings and corporate debt deals to skid to a near standstill. On top of that, analysts expect JPMorgan Chase, Morgan Stanley (MS, Fortune 500), Bank of America (BAC, Fortune 500), Citigroup (C, Fortune 500), Goldman Sachs (GS, Fortune 500) and Wells Fargo (WFC, Fortune 500) to announce new layoffs, in addition to the thousands they've already disclosed. So far this year, Bank of America said it would cut 30,000 jobs and Goldman announced 1,000 layoffs. To a lesser extent, Morgan Stanley said it would cut 300 'underperfoming financial advisors.' The other big banks have so far avoided any big layoff announcements. "The best way to cut costs is to cut people," said Paul Miller, a banking analysts at FBR. "There's been no lending and no trading and not a lot of people are being utilized." Morgan Stanley and Goldman Sachs are expected to take the biggest hit, since investment banking and trading make up the bulk of their overall revenue. For JPMorgan, Citigroup, Bank of America and Wells Fargo, these divisions only account for roughly one-third of their total. JPMorgan CEO Jamie Dimon already warned analysts that the firm's third-quarter investment banking revenue would be cut roughly in half to $1 billion from $1.9 billion. Dimon also estimated that the firm's bond trading revenue would be cut by one-third. Since the financial crisis, JPMorgan has often managed to report strong earnings but that's mostly because "JPMorgan lowers the bar and beats it," said Miller. Analysts said that this time around, Dimon's downside predictions might be on track. Still, JPMorgan's investment banking division only accounted for about 7% of the firm's overall revenue in the second quarter. By contrast, investment banking accounted for 24% of Goldman Sachs' revenue and 18% for Morgan Stanley. The current valuations of bank stocks may be the one bright spot for investors. They've dropped so far, that some investors and analysts question how much lower they can go, potentially making them an attractive 'buy' option. Bank of America's stock is down 52% so far this year. Shares of Goldman Sachs, Morgan Stanley and Citigroup have fallen 42%, 43%, and 44% respectively. And Wells Fargo and JPMorgan Chase have seen 24% and 15% declines so far this year. "Investor sentiment has turned so negative that we could have surprise upsides," said Jeff Harte, banking analyst at Sandler O'Neill. Furthermore, overall lending volumes are expected to be trending higher, giving a boost to Citigroup, Bank of America, JPMorgan Chase and Wells Fargo. But the elephant in the room remains Greece and Europe. Investors want to know just how much exposure these banks, particularly Goldman Sachs and Morgan Stanley, have to Greece and European sovereign debt. Analysts aren't expecting CEOs to offer too much granularity on that exposure during conference calls but investors will be grasping onto any hints, both good and bad.